With Aaron Ramsey secured, on a free transfer of course, Tuttosport are getting very excited about Juventus’ upcoming transfer window. Joao Felix, who has scored four goals and made three assists over his past two matches, is being increasingly linked. 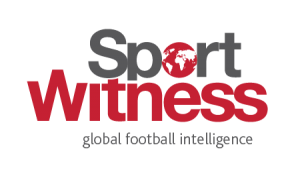 The 19 year old’s Benfica teammate Ruben Dias, who is 21 years of age, is also the subject of report interest, and then there’s Ajax’s 19 year old Matthijs de Ligt. And what happens when Tuttosport get all excited about Juve transfers? Yes, they bring Paul Pogba in of course. Tuttosport have a ‘Top Secret’ report and say Mino Raiola is set to meet with Juventus. He represents Moises Kean, who clearly deserves a new contract, Wesley (a 19 year old right back who left Flamengo and is expected to be signed by Juve), De Ligt… and of course Pogba. The Manchester United player has of course been linked repeatedly with Real Madrid recently, although those claims calmed a little towards the end of last week. Tuttosport’s hope seems to be that good relations built over a Kean renewal and the Wesley situation could then help with the Ajax and Manchester United stars. 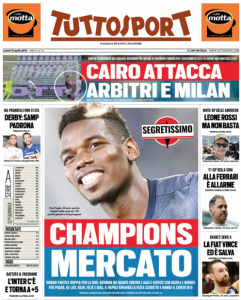 Pogba is splashed all over their front page, and inside it’s stated that before Jose Mourinho’s exit, the midfielder was close to a Juventus return. Should Manchester United not secure Champions League football for next season, it’s claimed ‘The Octopus’ (they nicknamed him that because his tentacles reach out and get the ball… we think) ‘will try to leave’ Old Trafford. The problem for Juve would be Real Madrid. Tuttosport love a Pogba story, but there’s not enough here to justify the front page they’re running today. And Felix, Dias, De Ligt, Pogba… that’s at least around €350mm maybe more than €400m.